Members of the Dayton Boat Club’s novice girls 8+ rowing crew practice in October. DBC girls novice team medaled in each event they entered at an October regatta in Columbus. This boys quad foursome was among the 77 Dayton Boat Club rowers to compete in recent events in Columbus, and Chattanooga, Tenn.
DAYTON — The Dayton Boat Club junior team finished its fall season with two races in Columbus and Chattanooga, Tenn. The DBC’s novice and varsity teams, totalling more than 70 rowers, competed on Oct. 28 at the Speakmon Memorial Regatta, in Columbus. Beavercreek High School student Anais Kypris Rawson raced for her first time on the novice team. The team medaled in every event they entered. The varsity team, with five rowers from Beavercreek (Rachel McNutt, Elena Muir, Sam Phillips, Neeti Prasad and Hannah Whitaker) won medals in six events at Speakmon and then headed to Chattanooga Nov. 3-4 for the second largest regatta in the nation — the Head of the Hooch Regatta. DBC entered 12 boats in nine different events in Tennessee. Varsity rowers Elena Muir and Rachel McNutt of Beavercreek placed fifth out of 76 in the women’s youth 8+ event. McNutt placed second in her 4+ boat, beating out 90 other entries. Winter is coming and DBC is looking for new rowers. Indoor rowing is the ultimate full-body workout and a fitness movement surging in popularity. From noon-1 p.m. Saturday, Dec 1, DBC officials will host an Open House event at Chaminade Julienne High School’s Student Conditioning Center, which is located at 77 Eaker St. in Dayton. 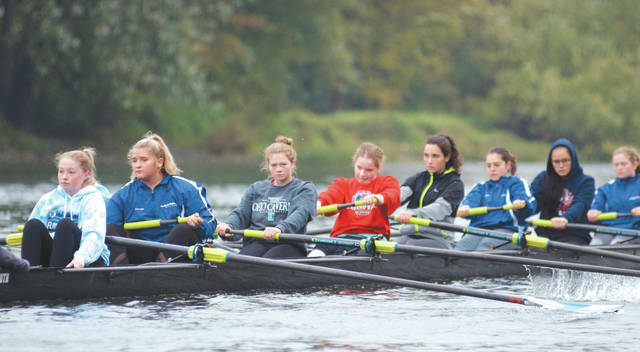 https://www.xeniagazette.com/wp-content/uploads/sites/32/2018/11/web1_DBCVarsityGirls8_PS.jpgMembers of the Dayton Boat Club’s novice girls 8+ rowing crew practice in October. DBC girls novice team medaled in each event they entered at an October regatta in Columbus. Submitted photos. https://www.xeniagazette.com/wp-content/uploads/sites/32/2018/11/web1_DaytonBoatClubVarsityBoysQuad_PS.jpgThis boys quad foursome was among the 77 Dayton Boat Club rowers to compete in recent events in Columbus, and Chattanooga, Tenn. Submitted photos. Go to daytonboatclub.org/novice.html or email rowdbc@yahoo.com for more info.